Exhibe Portable takes pride on offering a wide selection of products to suit everyone’s needs. Their trade show table throws offering is no different. They recently added new custom printed outdoor table covers to their product line. These covers are designed to cope with the rigor of marketing outdoors. El Cajon, CA, US – March 24, 2018 – For businesses that want to perform their best at marketing events a professional presentation is a must. Catering for exhibitors needs, a leading trade show display company Exhibe Portable has recently added new custom printed outdoor Trade Show Table Cover products for extra visual impact. Experts concur that standing out from the crowd is a smart way to bring in more attention increasing the chances of a company accomplishing their trade show goals, whether it be sales, getting new leads, or obtaining other benefits. A tried-and-true authority in trade show displays business Exhibe Portable offers a very diverse catalog of trade show products for every need and occasion. 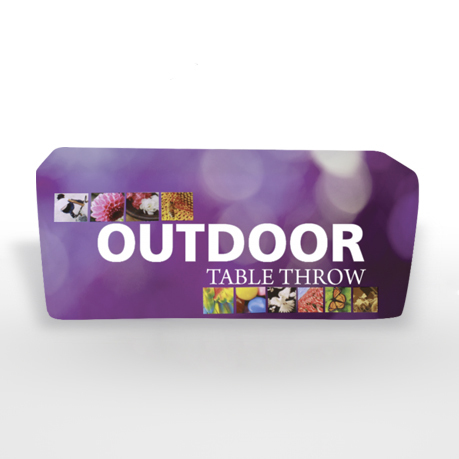 And now an exciting news, the company has recently announced they had expanded their line to now include premium quality indoor and outdoor custom printed Trade Show Table Covers, all available at quite attractive price points. According to Exhibe Portable, they offer at least a dozen different options, with one sure to meet nearly any client’s needs. Some popular highlights include table throws, which can cover unsightly table legs, or less-than-ideal looking tables, allowing customers to focus instead on what’s being offered; runners, skirts and fitted table covers are also great options for those who would like to take a more professional and sleeker looking approach. The Exhibe Portable team is always more than willing to help with selecting a best product for a customer based on the functions they need or would like covered. Exhibe Portable is happy to invite anyone to the San Diego area and come by their special showroom to check out table covers and other display booth products they offer first hand. The company is proud to work with the best manufacturers in the United States and stand behind their catalog fully. Feedback from clients continues to be extremely passionate. Be the first to comment on "Trade Show Display Experts Exhibe Portable Announces Launch of Custom Printed Trade Show Table Covers"